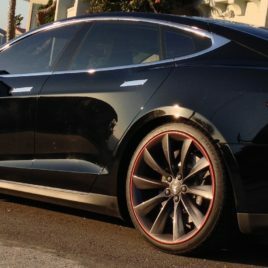 Protect your wheels from curb rash damage by installing RimSavers on your wheels. They provide a barrier between the wheel rim and the curb. They simply stick to the wheel with a very high bond tape for easy DIY installation, with no removal of the tire required. RimSavers have a guide lip on the top side of the strip that provides extra protection and makes fitting very easy. The included clips add strength and cover the seam so the cut doesn’t have to be perfect. RimSavers are lightweight and durable. 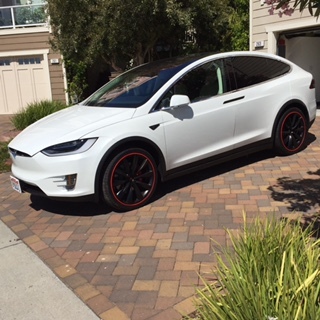 Pic from 10 colors, to blend well with your wheels like Silver, Black or Bronze or a vivid color, like Lime Green, Yellow or Red to add a unique and exciting look to your Tesla. Indicate in the “Notes” section of the order form which color RimSavers you are ordering. Note: if your wheels have Tire Black overspray or have been coated with a ceramic sealant such as Opti-Coat, CQuartz or NanoGlass; it is imperative that such products be cleaned from your wheels prior to installation so that the adhesive on RimSavers will properly bond. Indicate in the “Notes” section of the order form if your wheels have a ceramic coating.